Step Away from the Books Washington and Lee students are on the move thanks to a robust collection of club sports, intramurals and exercise classes. (l-r) Hannah Powell ’18, Emily Cole ’18, Michelle Dreimann ’19 and Mia Harvey ’19, all members of the Skiing and Snowboarding Club at W&L. 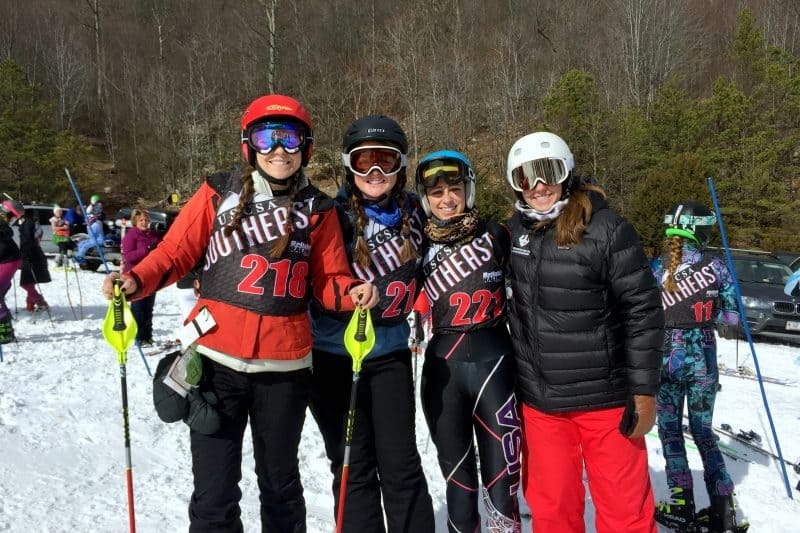 Michelle Dreimann ’19 attended Stratton Mountain School, in Vermont, specifically to focus her high school years on both academics and competitive skiing. She was determined to find a college where she could keep pursuing her passion for powder while working toward a future career in business. Knowing that, some might be surprised that Dreimann chose Washington and Lee University over the University of Denver. But a major factor in her decision — besides academics — was the knowledge that although W&L did not already have a skiing club, it did have a robust Campus Recreation Program that would allow her to start her own. Two years later, Dreimann is president of W&L’s Skiing and Snowboarding Club, which has 250 members. “It has given me such a variety of people that I probably wouldn’t have met otherwise, and it’s given me such a broad network of people I can reach out to,” she said. There is no question that Washington and Lee has a strong varsity athletics program. 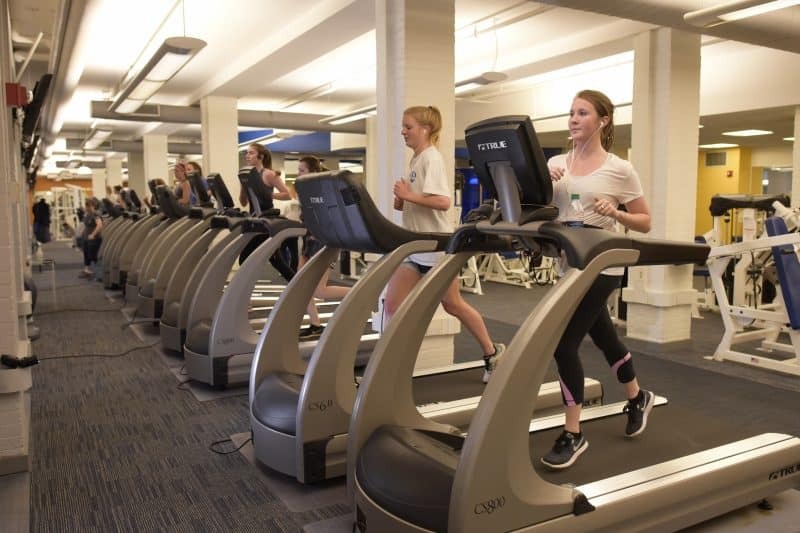 Dreimann’s experience, however, underscores the value of W&L’s array of recreational opportunities such as club and intramural sports, group exercise classes, and outdoors programs, not to mention a well-outfitted fitness center. Not only do these features draw prospective students, but they also they keep them healthy and happy while they’re enrolled. Over the past decade, Washington and Lee’s campus recreation options have grown exponentially. Sixty to 70 percent of the student body is involved in sports clubs or intramurals, and the number of clubs has tripled. More members of the campus community are taking advantage of the fitness center than ever before, and the number of group exercise classes offered is about five times the number available when the program first began. In addition, the Outing Club, which technically falls under Student Affairs but is unquestionably a major part of the university’s recreational offerings, attracts hundreds of new members in the first month of each academic year (see sidebar). And new additions to campus, including the natatorium and a disc golf course, round out a thriving set of offerings. The health of these programs has been a driving force in Washington and Lee’s decision to completely renovate Doremus Gym and the Warner Center. When the Warner Center was constructed in 1972, the school had 400 undergraduates and 11 varsity sports; today, it has nearly 1,900 undergraduates and 23 varsity sports. Both the athletic program and campus recreation make the best possible use of the facility, but Athletics Director Jan Hathorn said the Warner Center is bursting at the seams. “What we do in this building is sort of its own little minor miracle,” Hathorn said. Walker Tiller ’17 spent a spring Sunday on Buffalo Creek with W&L President Will Dudley, who had told the wluLex team in an interview that learning how to fly-fish was on his bucket list. 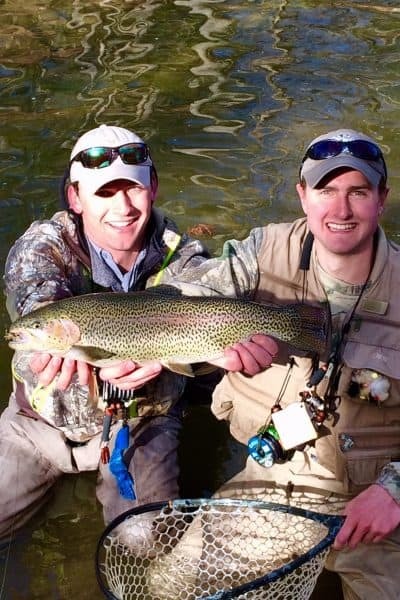 Tiller, president of the W&L Fly-Fishing Club, said he and fellow club members Gordon McAlister ’17 and Lendon Hall ’17 were happy to share their enthusiasm for a hobby that has enriched their time at Washington and Lee. Walker Tiller ’17 (left) and Lesesne Phillips ’18L show off a big catch during the annual W&L and VMI Fly-Fishing Tournament. Tiller is president of the W&L Fly-Fishing Club. A native of western South Carolina, Tiller has been fly-fishing since he was 8 years old. “The outdoors has been a big part of my life, so when I found out there was a fly-fishing club at W&L, I was excited to get involved,” he said. The six-year-old club is one of nearly 30 sports clubs at W&L; a decade ago, there were fewer than 10. Other clubs include badminton, baseball, basketball, cheerleading, eventing (an equestrian sport), golf, ice hockey, ping pong, racquetball, rock climbing and much more. A couple of new clubs, including water polo, are in the works. The fly-fishing club has 82 members, about 30 of whom are active. They go on two big fishing trips each year, in addition to hosting smaller events such as casting lessons. Every spring, they hold a tournament with VMI, an event that helped the club earn sponsorship from Trout Unlimited and the sunglasses company Costa del Mar. The club has also collected supplies for Project Healing Waters, a nonprofit that uses fly-fishing for physical and emotional rehabilitation of disabled, active-military personnel and veterans. As in Dreimann’s case, many students who start a sports club find themselves leading the club and helping to shape its future. The Skiing and Snowboarding Club has some members who race and others who ski for fun. They have designed and sold T-shirts to raise money, arranged discount lift tickets at local ski resorts, and secured sponsorship — and matching club apparel — from Patagonia. Although she is only a rising junior, Dreimann has already selected an incoming first-year student to take over as president of the Skiing and Snowboarding Club when she graduates. 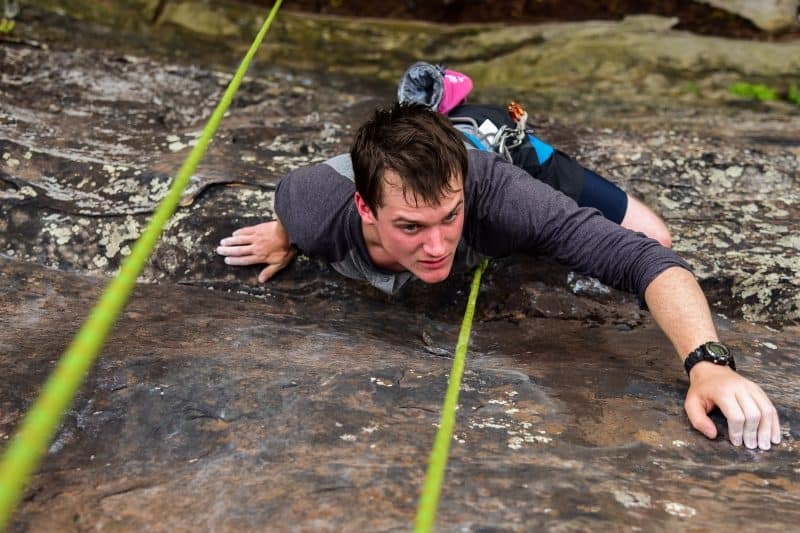 Parrish Preston ’17, a member of the Crux Climbing Team, practices his skills at New River Gorge. For those with a more competitive spirit, Washington and Lee is home to six intramural leagues. Fall Term brings soccer, flag football and handball, while volleyball, basketball and ultimate Frisbee are played during Winter Term. With up to 20 teams per league, that translates to hundreds of games each year. Darby Lundquist ‘17 served as a referee and supervisor for intramurals since she was a first-year. She enjoyed the work-study position because it exposed her to many different people on campus. As a member of the varsity basketball team, Lundquist appreciated that intramurals allow students to compete in a sport they love, but with far less stress. “There are so many people who play intramurals, and they are good but they don’t have time or they don’t think they want to be dedicated to a sport,” she said. “Some just play for fun and others do take it seriously — we get a good mix. When college tour season is in full swing, it is not unusual to see groups of prospective students and their parents traipsing through the fitness center. Those who are used to hitting the gym on a regular basis may take it for granted, but director Chris Schall never does. Schall keeps statistics that show during an average week in 2011, the fitness center had 2,000 to 2,500 visits. Today, the weekly average is about 3,000 visits — and those are just the folks who remember to scrawl their name on the sign-in sheet at the front desk. The 10,000-square-foot facility is open to students, staff, faculty, family members and guests. Although the fitness center is already well outfitted, the increase in usage means it could benefit from some additional features. Those include more open floor space for stretching, core exercises and dynamic warm-ups; updated equipment; and more (and quieter) weightlifting platforms. Since there is always a waitlist for lockers, larger locker rooms are also on the wish list for the facility. Those changes and others are being considered as the university finalizes plans for the Warner Center renovation. The W&L Fitness Center is a popular spot to work up a sweat. Another area that has seen significant growth is group fitness. What started with a handful of classes 10 years ago has jumped to 30 to 35 classes per week during winter, the busiest season for indoor exercise. These classes include such offerings as boot camp, group cycling, yoga and Pilates. Sticking with newer fitness trends, the college also offers TRX, a combination of yoga and Pilates called PiYo, and a dance workout called WERQ. Instructors are all certified. Of course, if a treadmill or exercise studio holds little appeal on a nice day, eight miles of walking and running trails, including the Woods Creek trail, beckon from the back section of campus. The new third-year housing community, The Village, has put more students on campus — and placed them closer to that network of trails. “It’s serving a really great purpose and getting used more than ever,” Hathorn said. The completion of W&L’s new natatorium may make it possible to offer additional classes in the future. Although nothing is set in stone, Kami Gardner, aquatics director and swim coach, said the new pool would be ideal for water aerobics classes. The pool is also used for scuba lessons, as well as canoeing and kayak classes, and it may end up hosting fun student activities such as a swimming-and-movie night. The same can be said for the entire Campus Recreation Program at W&L, which continues to evolve. As it is, Ellington said, W&L’s program beats out those of many schools in the New England Small College Athletic Conference, the group he most often uses as a measuring stick for campus rec. Those schools average far fewer sports clubs, intramural events and group exercise classes than Washington and Lee. For prospective students, campus recreation is increasingly eye-catching. Ellington said the Admissions staff forwards him emails every week from students and parents with specific questions about how they can pursue a variety of interests when they get to W&L. 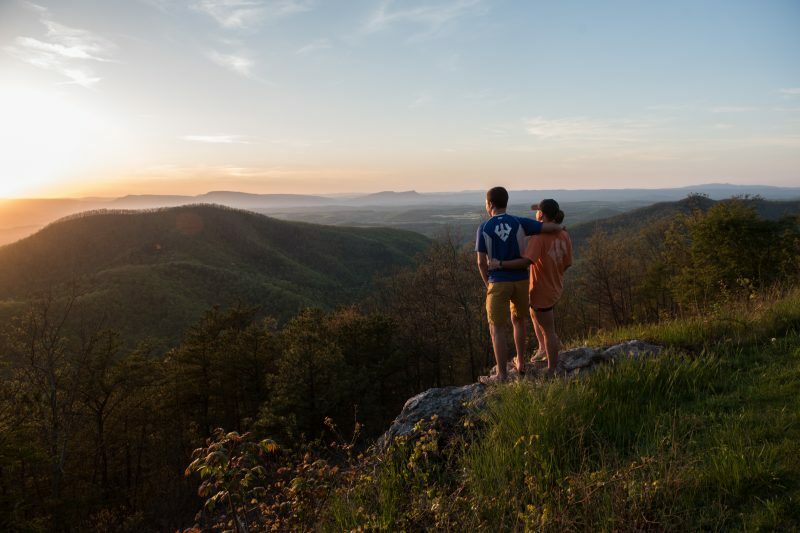 Landon Courville ’19 and Liz Todd ’19 watch the sunset from the Blue Ridge Parkway.